The Hubert Fine Jewelry Collection features many beautiful colored Green gemstones, including Tourmalines and Peridot, however Emerald is the most associated with the lushest landscapes and richest green tones in the world. Ireland is the Emerald Isle. Seattle, in the US state of Washington, is the Emerald City. Thailand’s most sacred religious icon is called the Emerald Buddha, even though it’s carved from green jadeite. The first Emerald mines dating back as far as 330BC, were known to be in Egypt. Today most of the Emeralds on the market originate from Colombia, Brazil or Zambia in Africa. Emerald is the most well-known gemstone of the Beryl family of minerals. The color of Emeralds ranges from shades of very pale light green, all the way to a deep forest green depending on the origin. Emeralds are colored green by trace amounts of chromium and sometimes vanadium. Emeralds are delicate and are often considered “soft” stones. They have a hardness of 7.5-8 on the Mohs Scale. 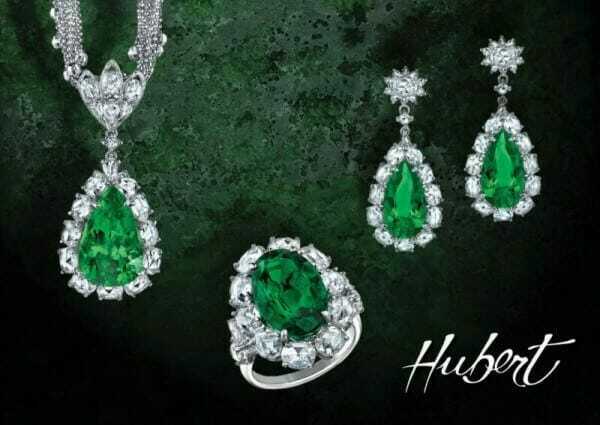 Browse the Hubert Gallery for beautiful Emerald jewelry!